EVM is a powerful methodology that gives stakeholders the ability to visualize a project’s status at various points during the project life cycle. Management of government projects, programs, and portfolios—and the related expenditures of public funds—are major, visible areas of interest and concern. Emphasis on performance improvement in government continues to increase steadily, supported by mandates imposed by government laws and public pressure. Despite a growing understanding of the determinants of success, increasing maturity, and a stream of successful programs and projects, project failures continue at an alarming rate. 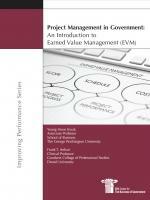 Earned Value Management (EVM) is a powerful methodology that gives the executive, program manager, project manager, and other stakeholders the ability to visualize a project’s status at various points during the project life cycle and consequently manage projects, programs, and portfolios more effectively. EVM helps provide objective project assessments when applied appropriately, and clearly quantifies the opportunities to maintain control over cost, schedule, and specifications of various types of projects. EVM helps managers in making evidence-based decisions about project scope, resources, and risks; hence, it allows effective control and project oversight. The National Aeronautics and Space Administration (NASA) has been one of the pioneers in the U.S. government in using project management principles, tools, and techniques, and consistently demonstrates the effective application of EVM to the oversight and management of its many projects and programs. This report describes how NASA applies EVM principles to accomplish agency objectives, strategies, and missions. By using EVM, NASA also complies with relevant federal government regulations that require continuous monitoring and control of projects and programs.